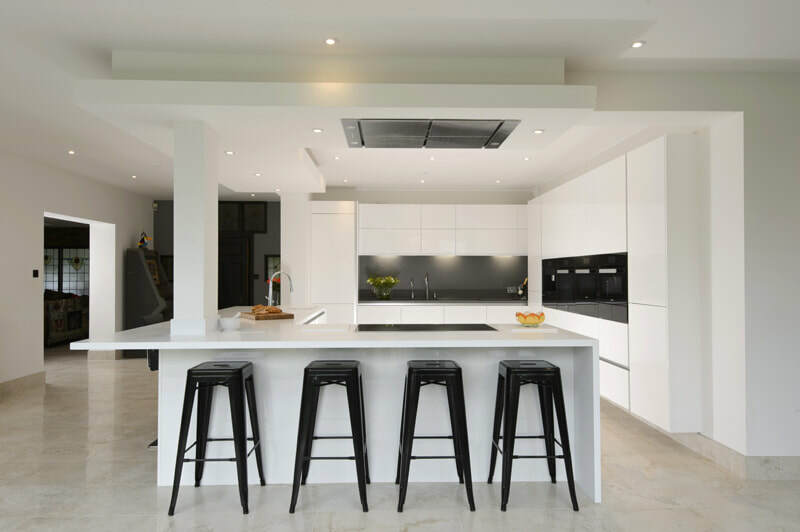 This contemporary kitchen embodies minimalism through its use of clean lines; the sharp monochrome scheme is packed with useful storage meaning that a feeling of space can remain without unnecessary clutter. 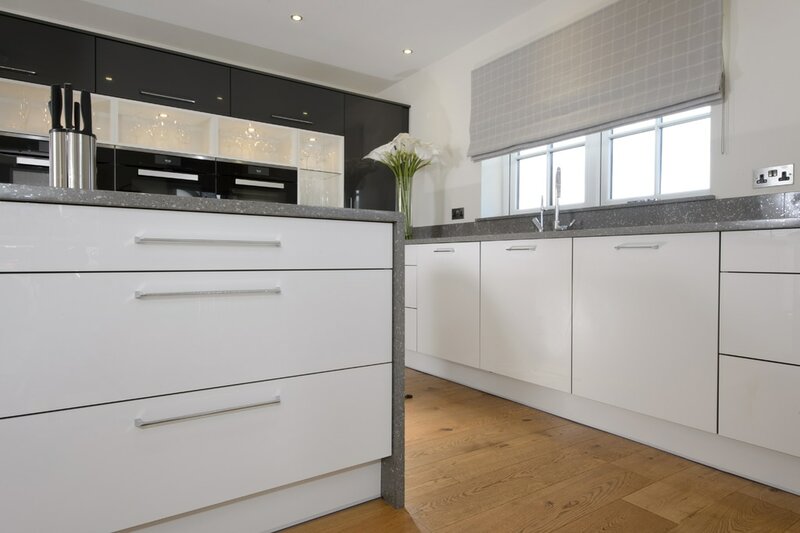 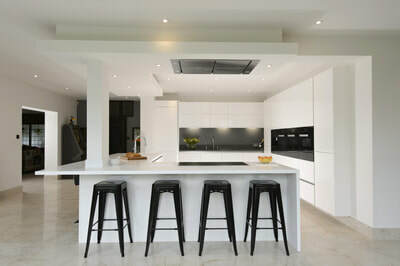 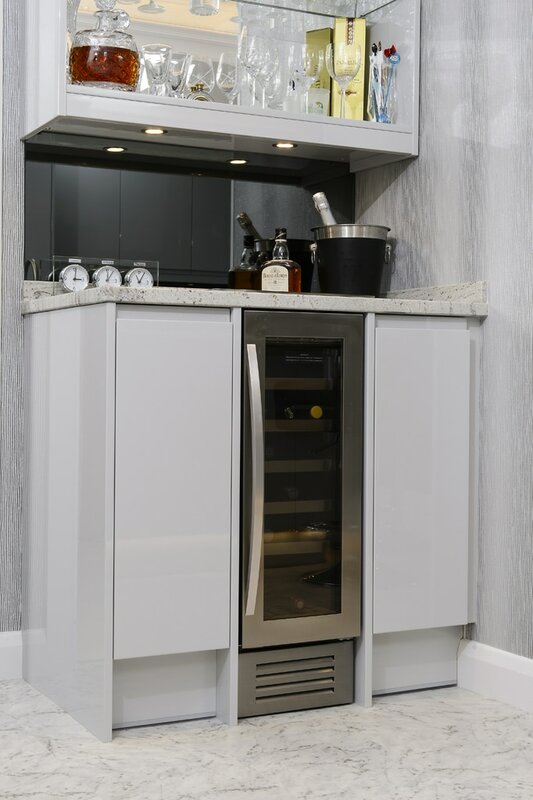 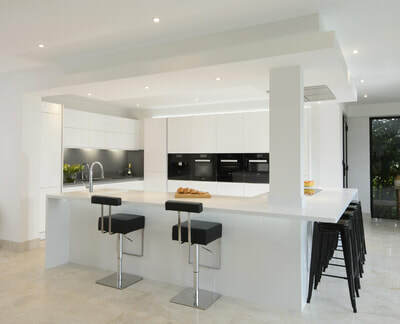 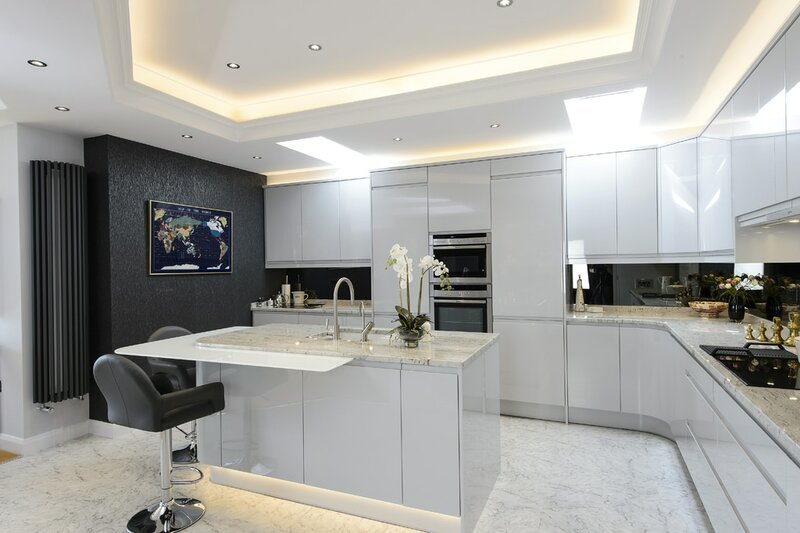 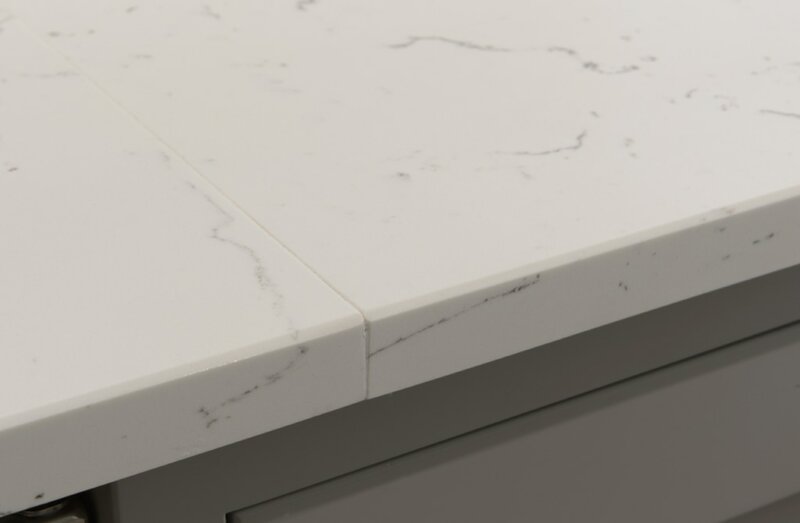 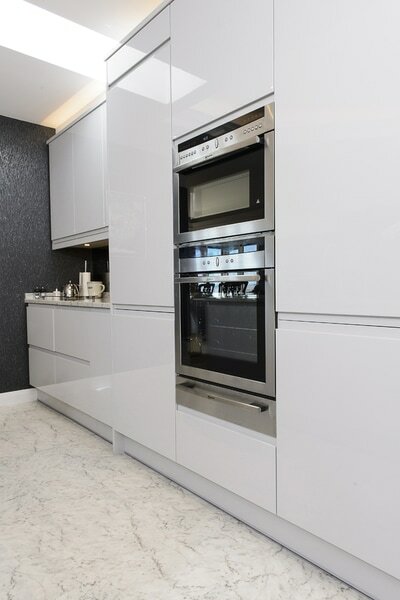 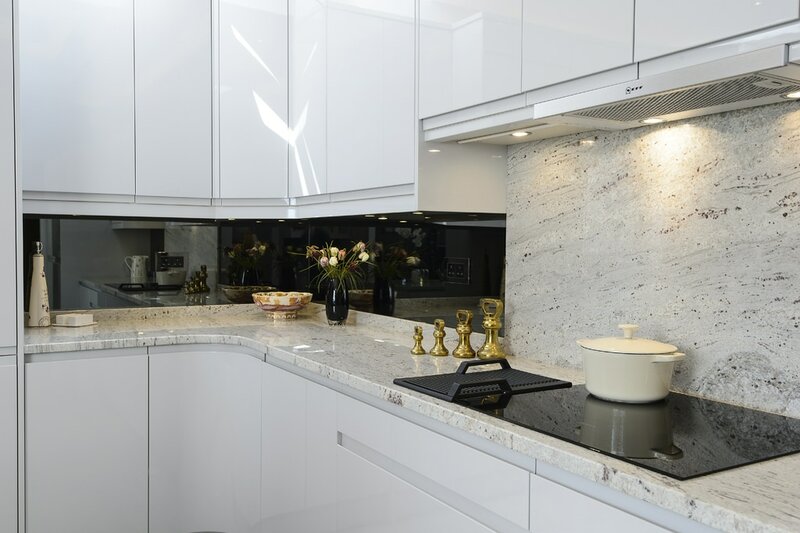 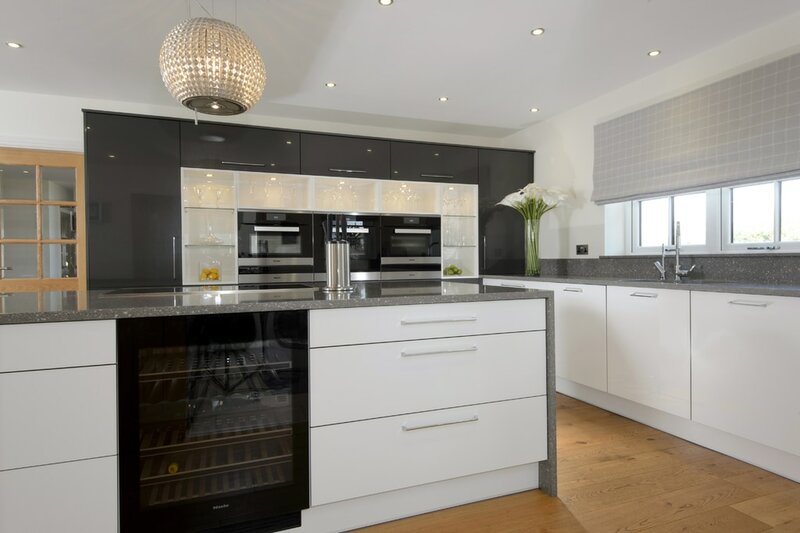 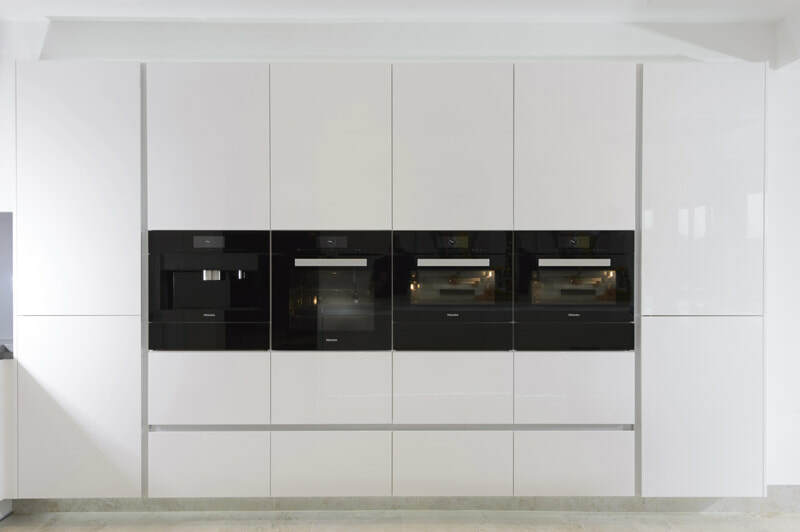 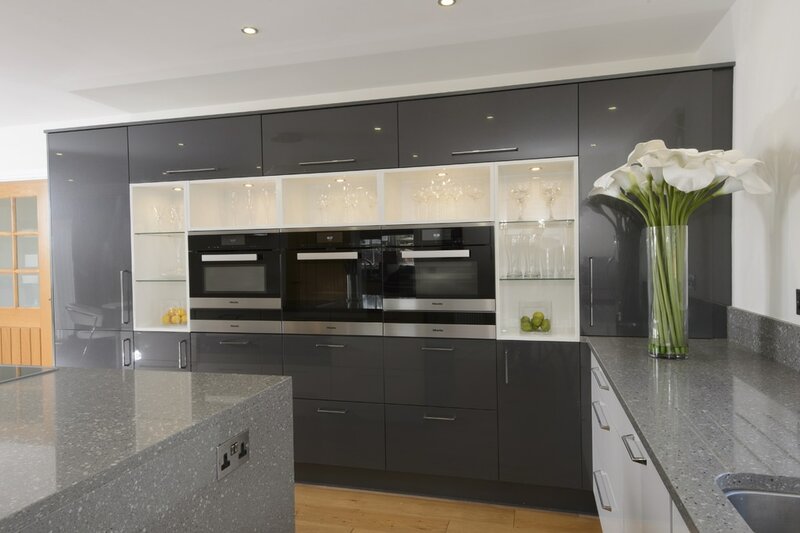 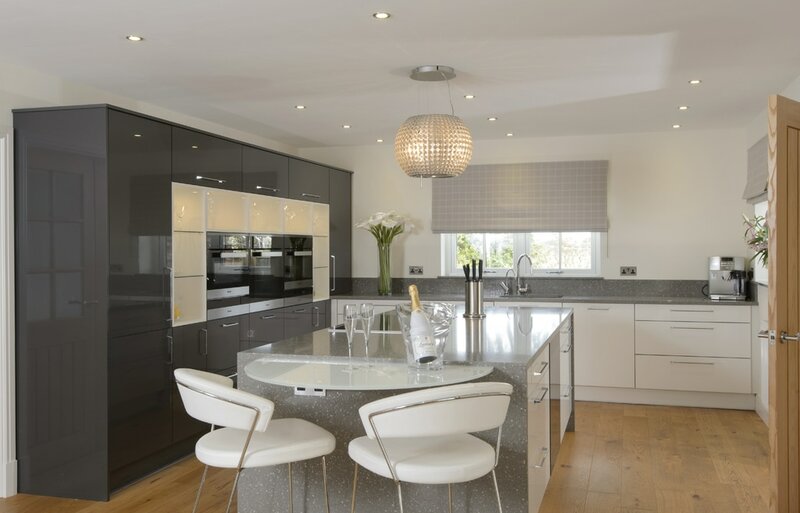 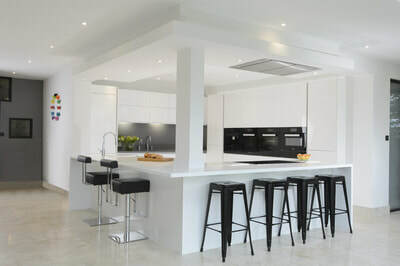 The white high gloss handleless units allow for the Miele M touch appliances in Obsidian Black to make a statement of their own, while Corian work surfaces seamlessly wrap around the units and the ceiling feature mirrors the island, embracing the essential structural post. 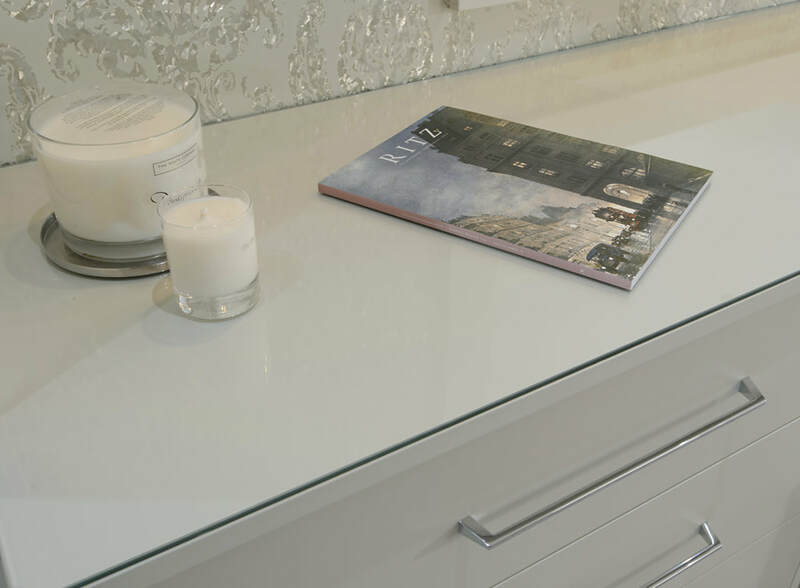 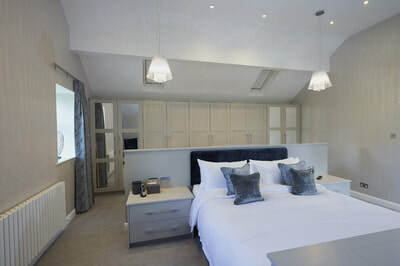 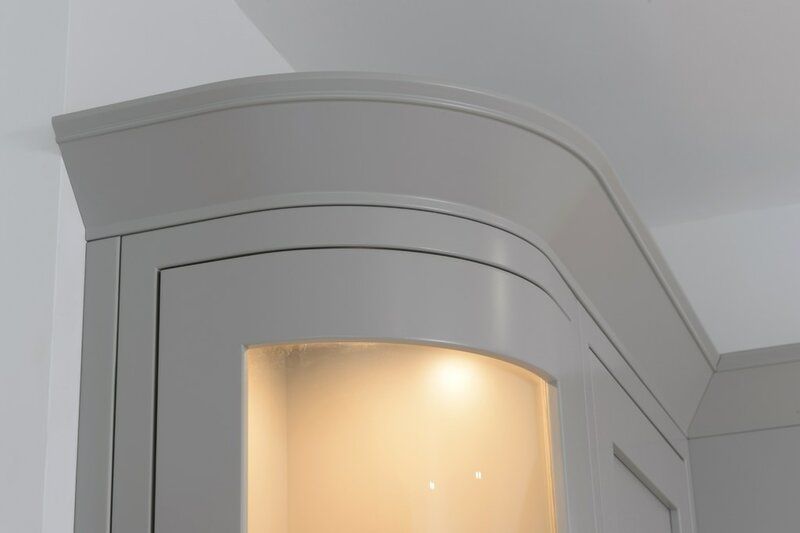 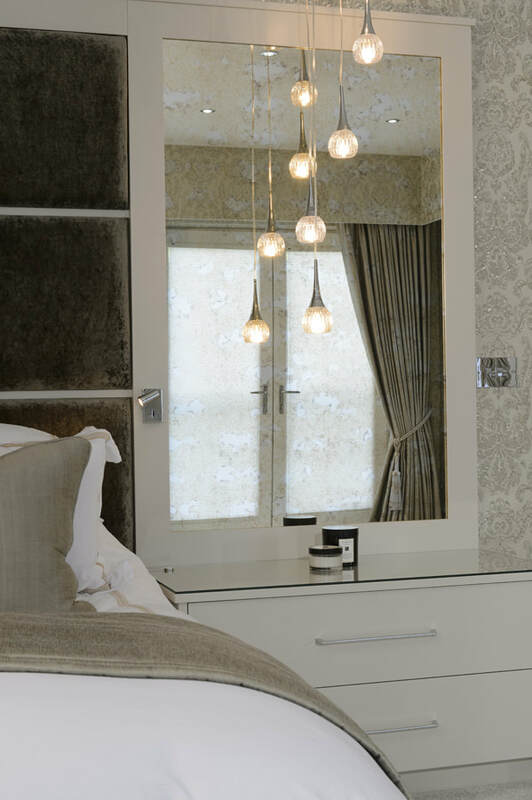 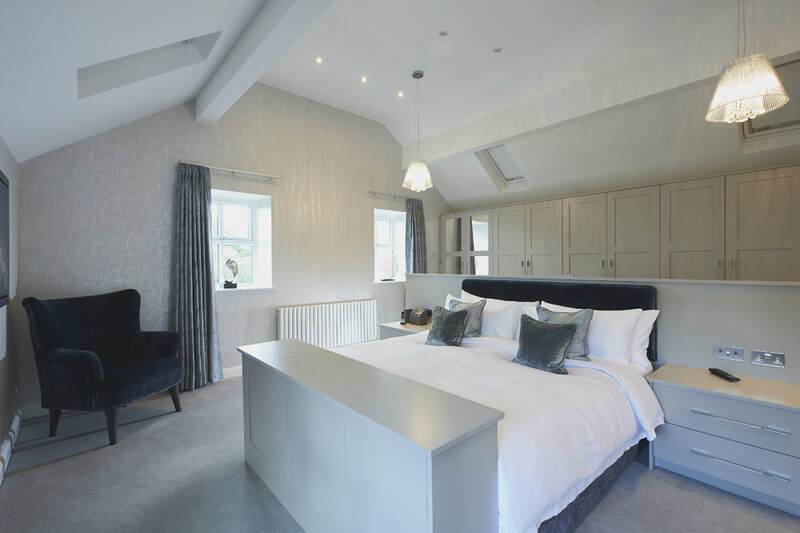 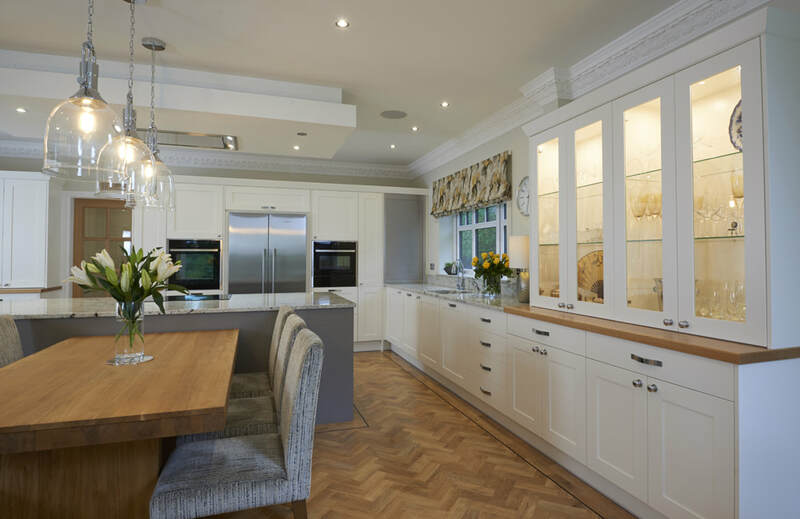 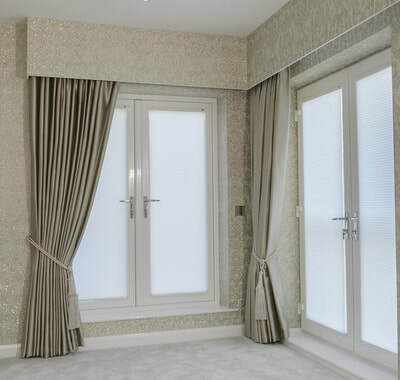 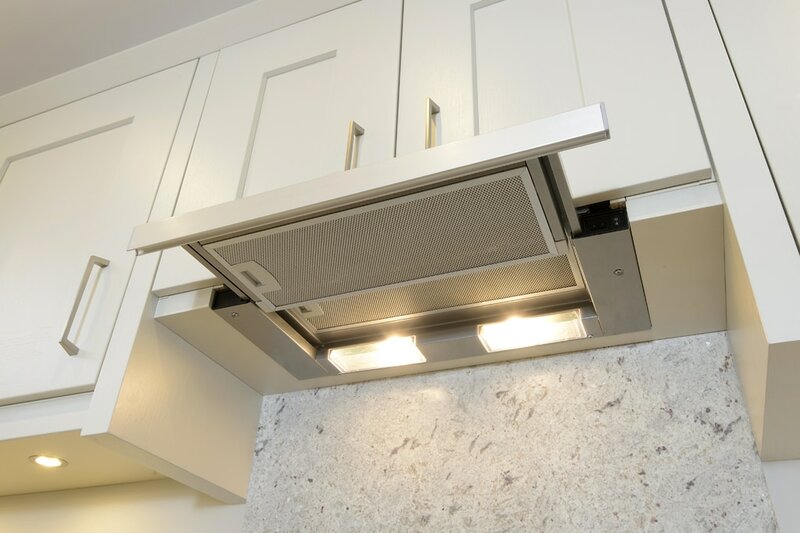 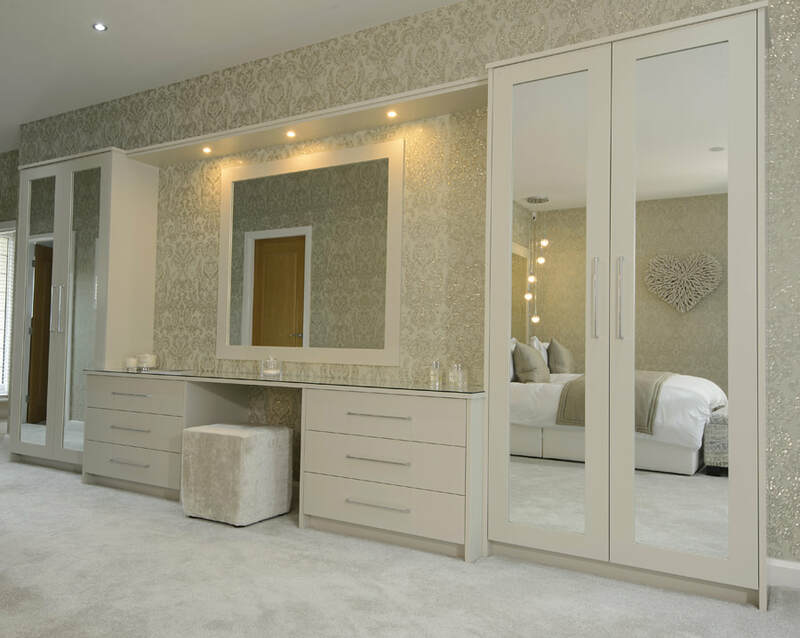 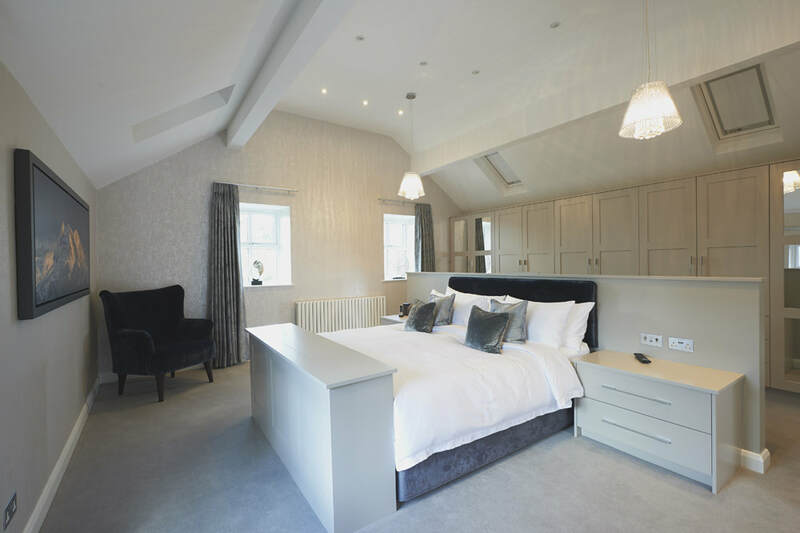 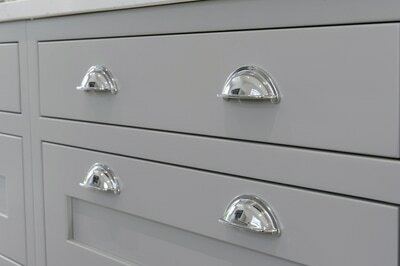 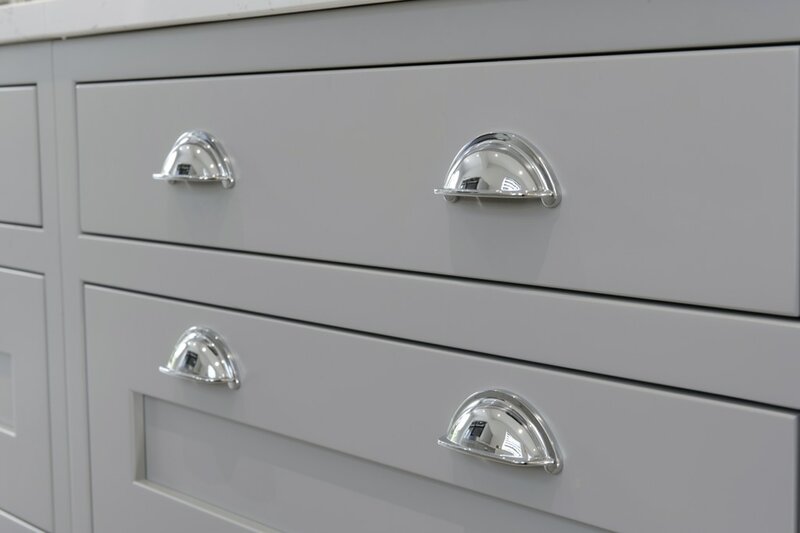 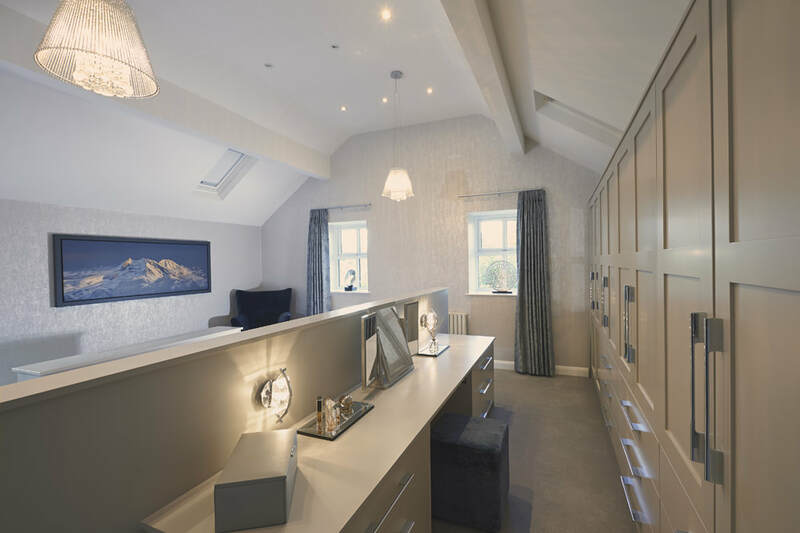 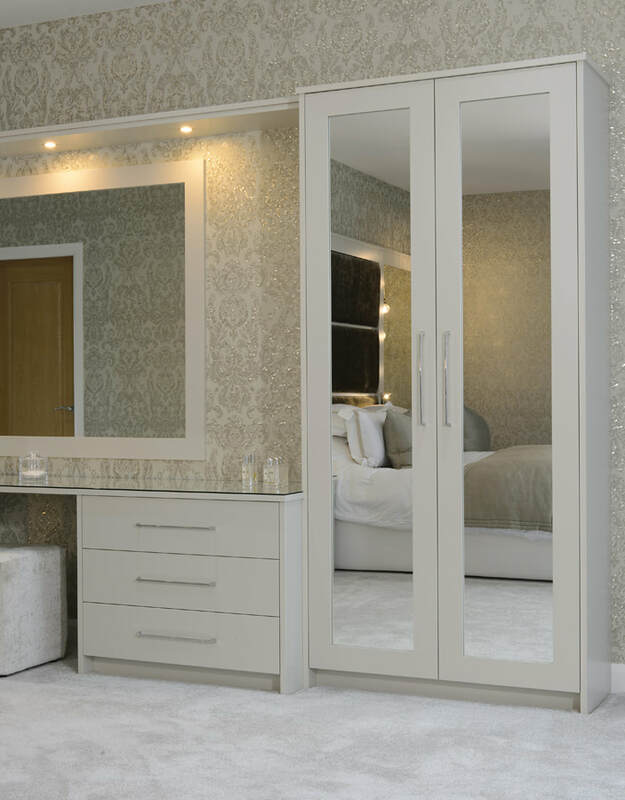 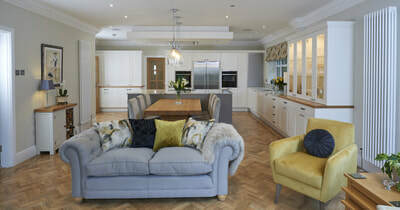 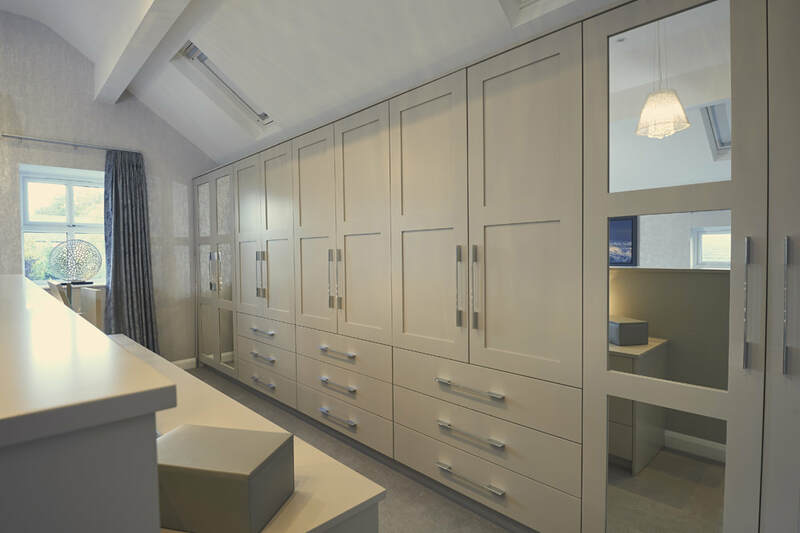 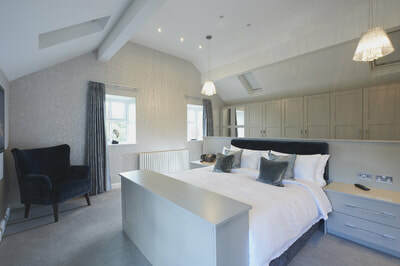 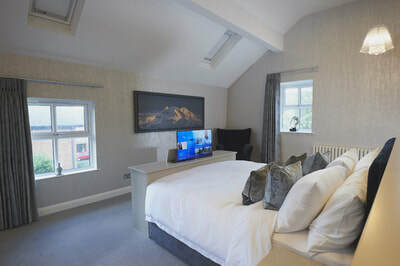 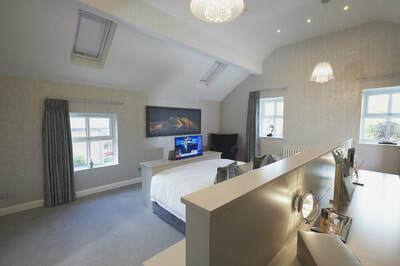 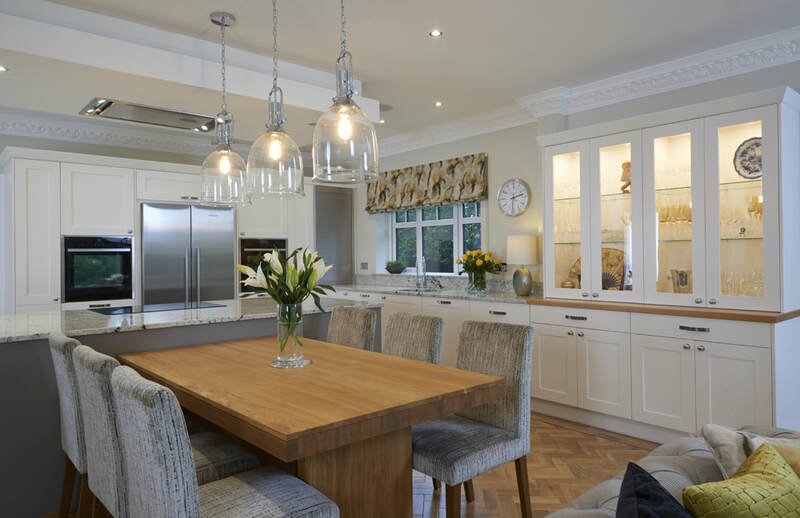 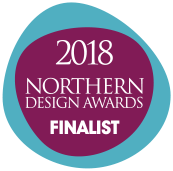 ​As a large sized master bedroom, the bespoke painted furniture was integral to bringing functionality and warmth into the room, complimented by mirrored doors and drawers. 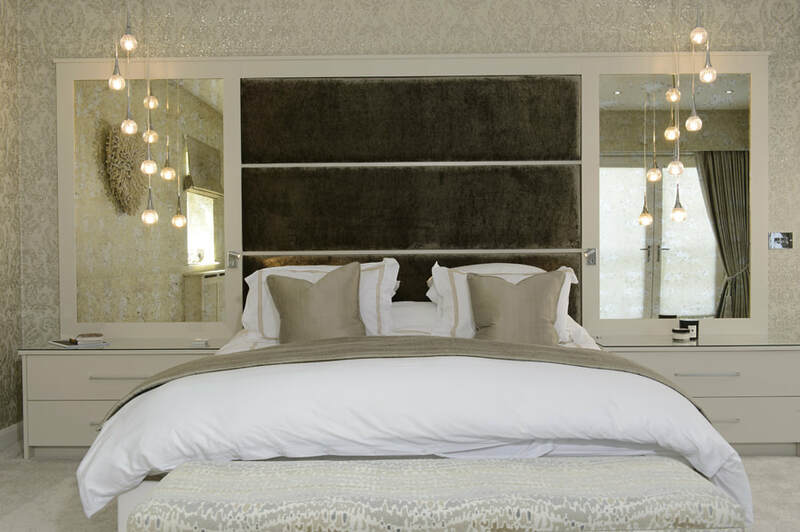 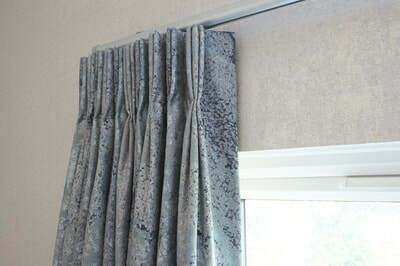 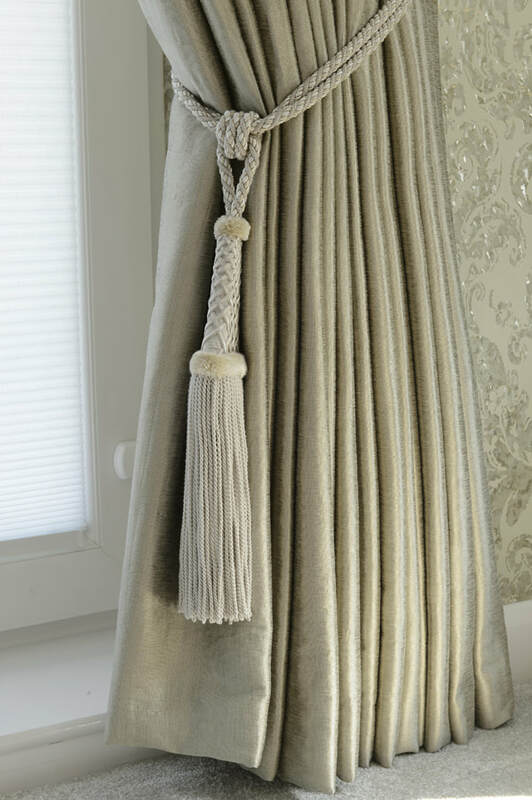 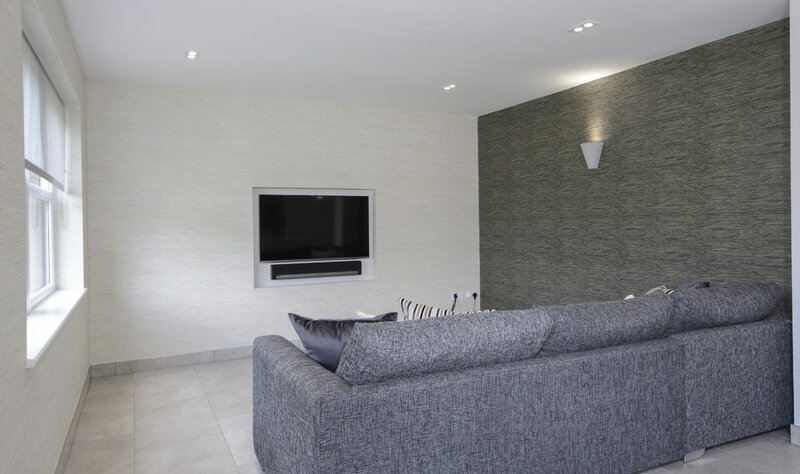 The space is brought together with the statement headboard Harlequin velvet whilst the muted green and greys throughout the rest of the room present a calm colour scheme. 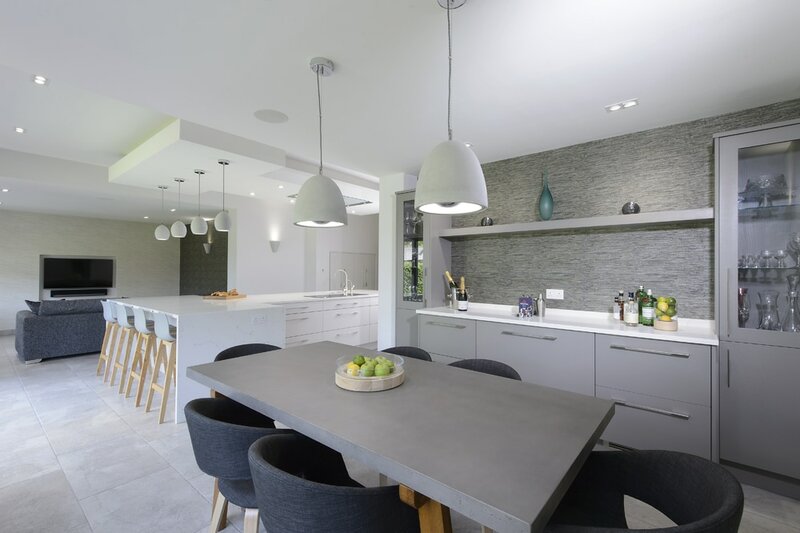 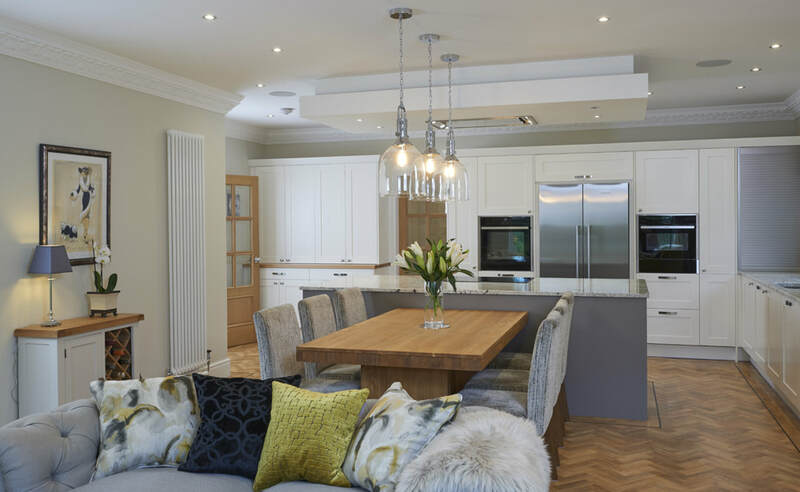 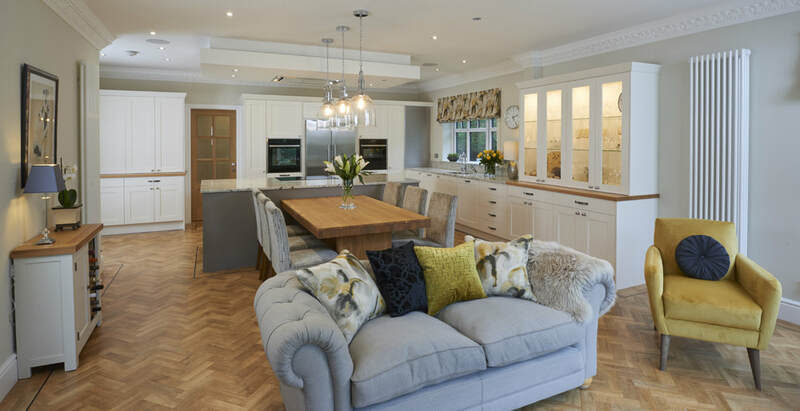 ​Contemporary kitchen, dining and living room with oak veneer painted doors, Quartz worktop, Miele appliances and concrete effect lighting. 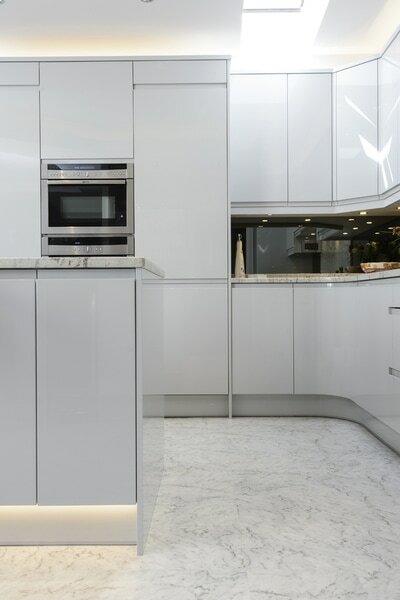 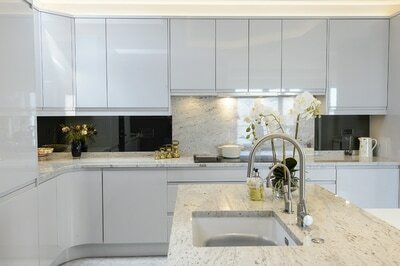 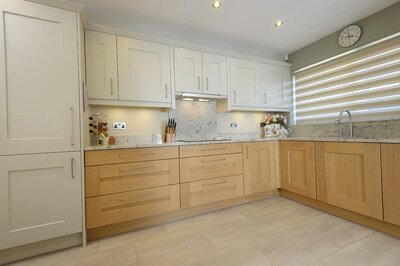 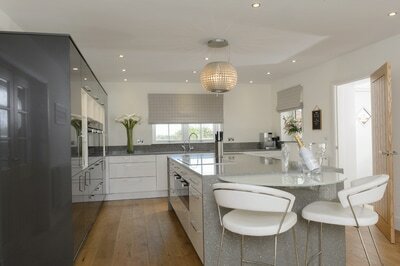 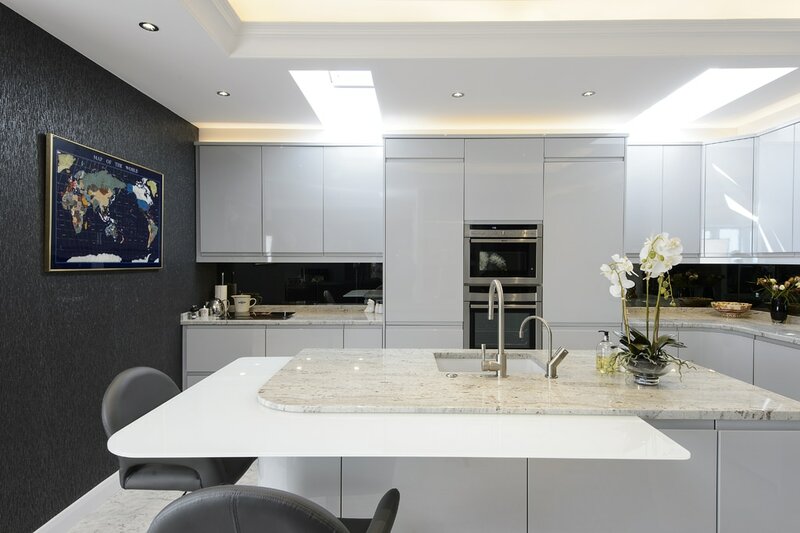 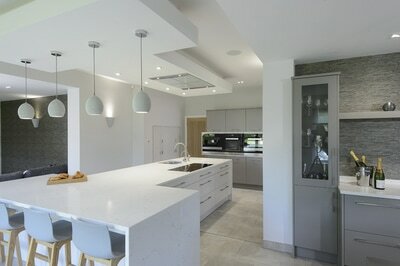 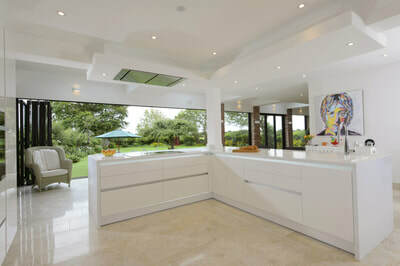 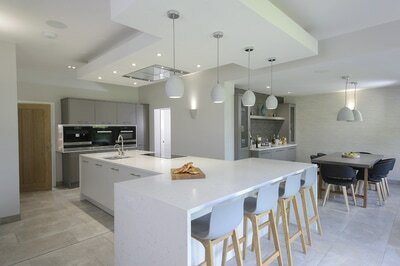 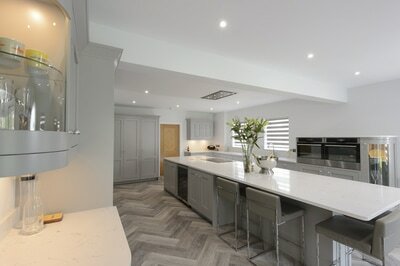 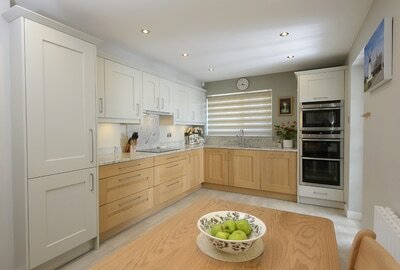 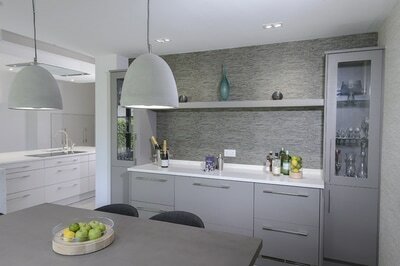 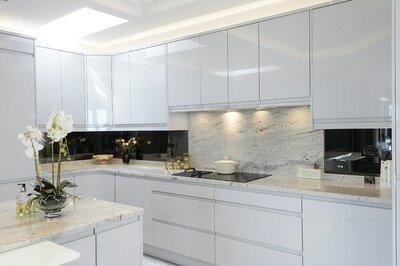 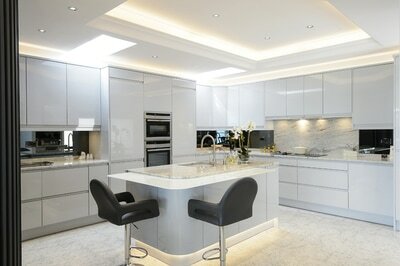 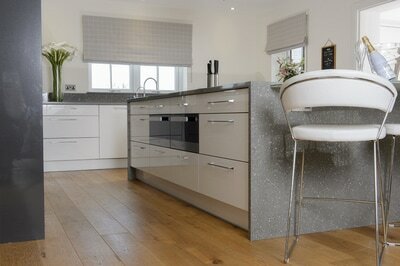 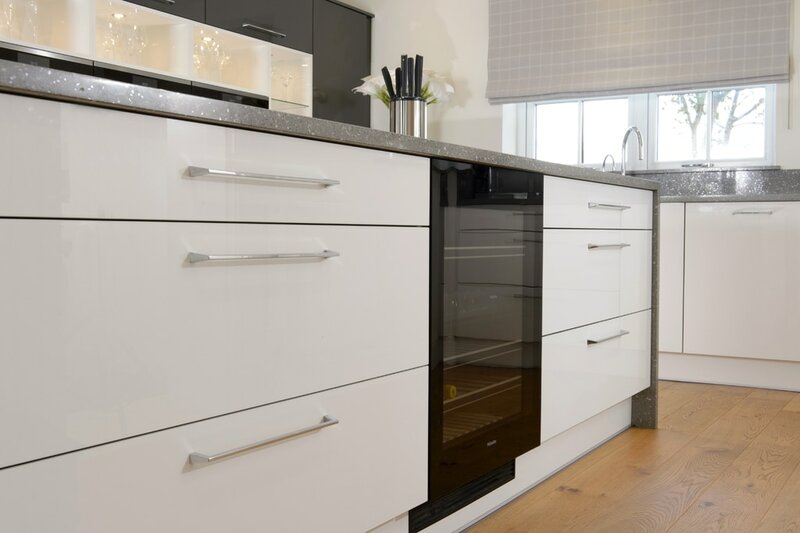 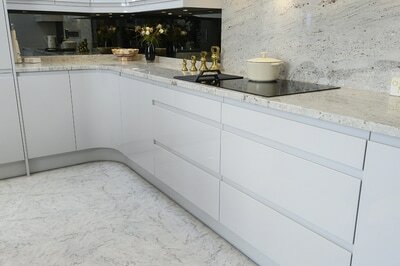 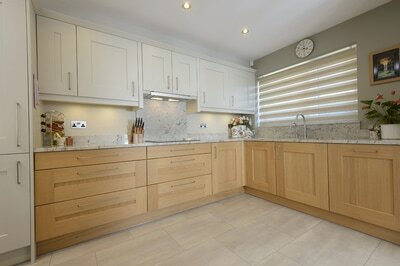 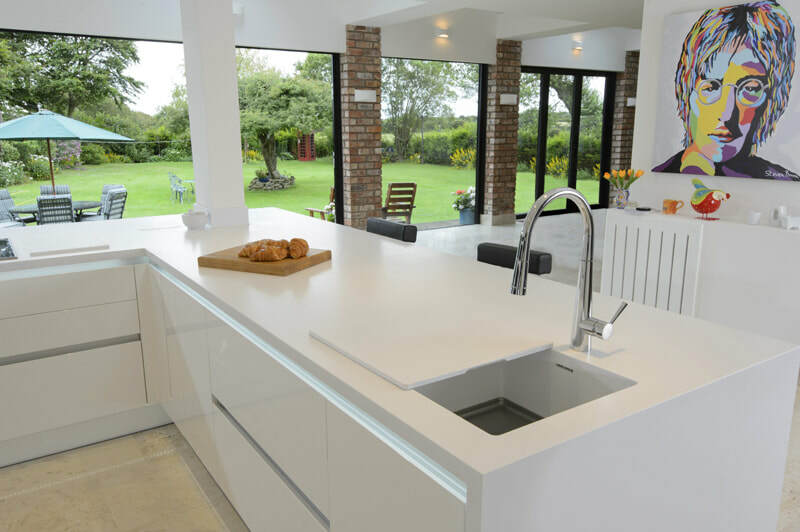 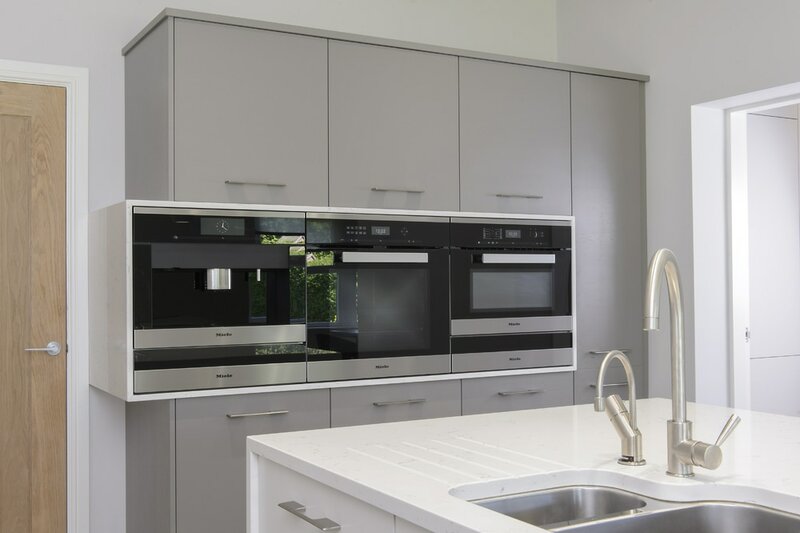 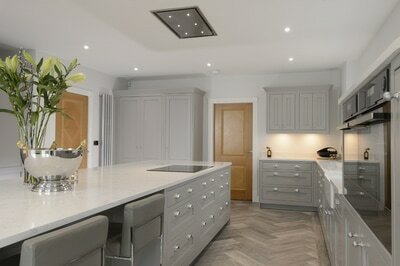 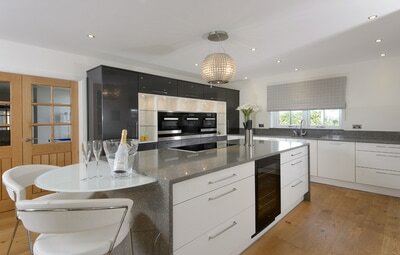 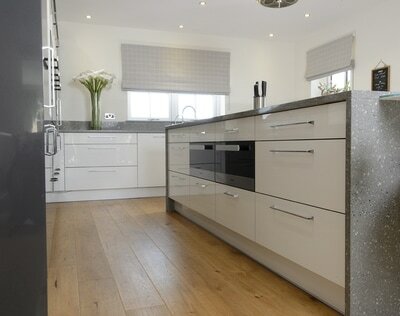 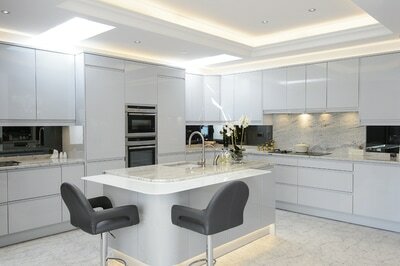 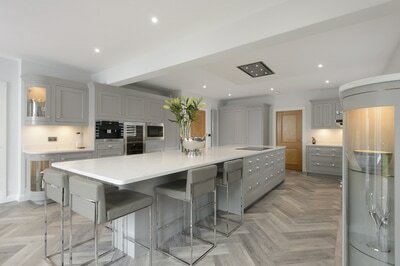 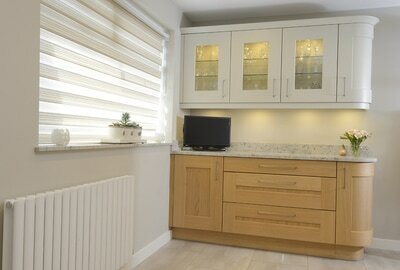 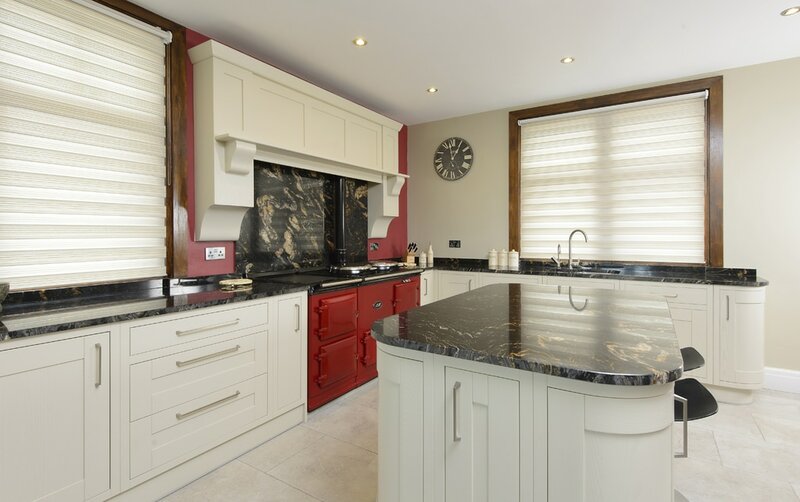 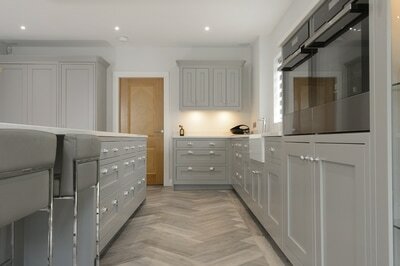 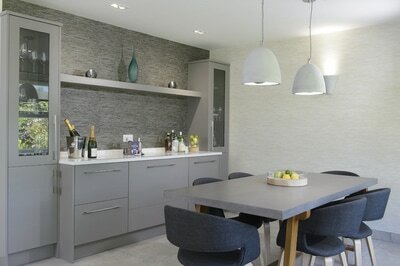 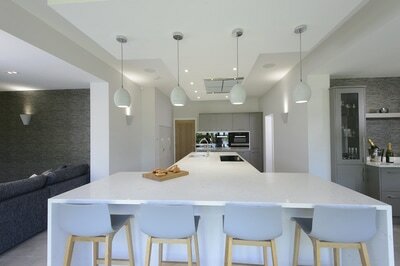 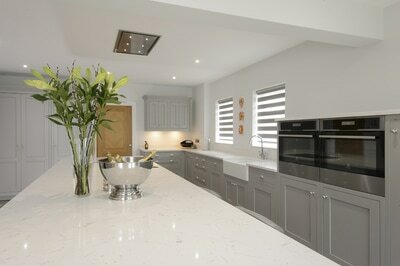 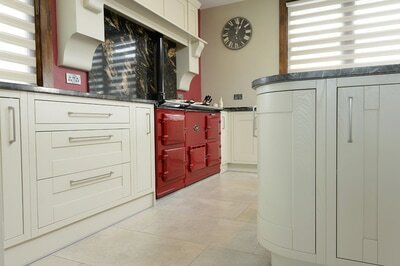 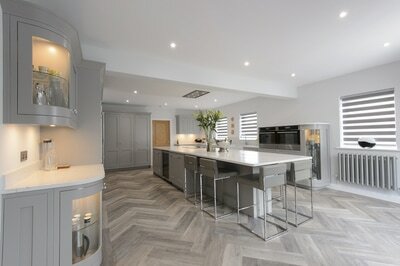 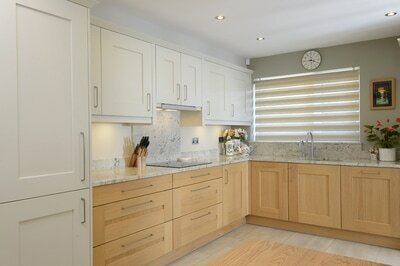 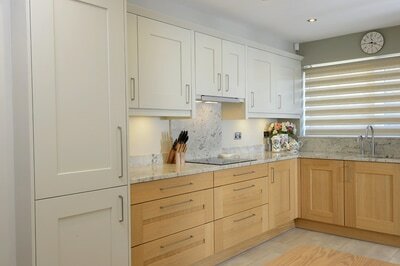 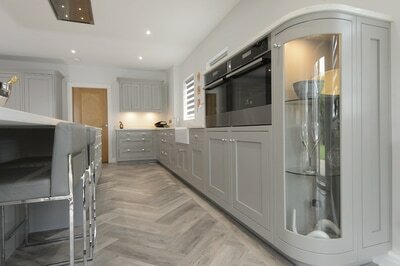 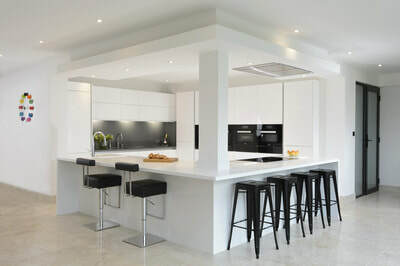 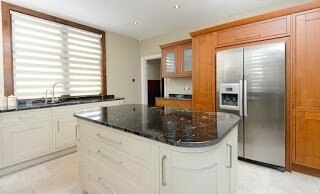 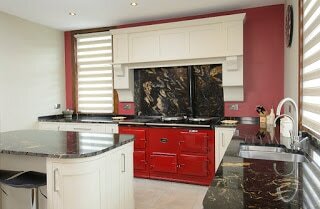 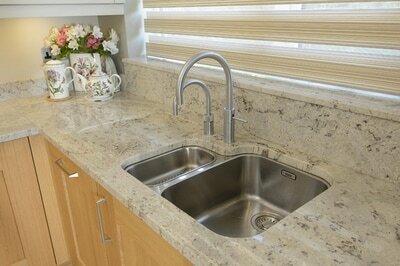 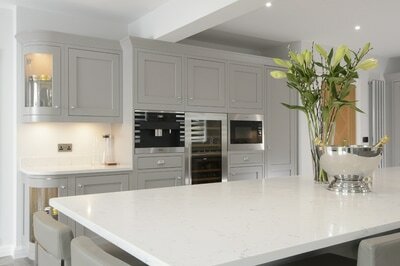 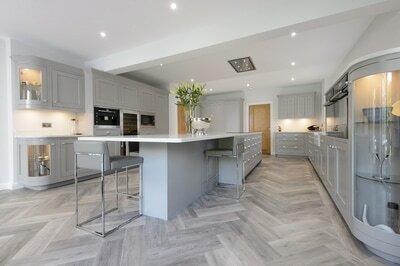 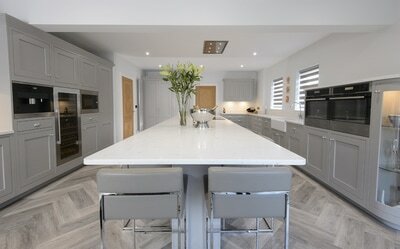 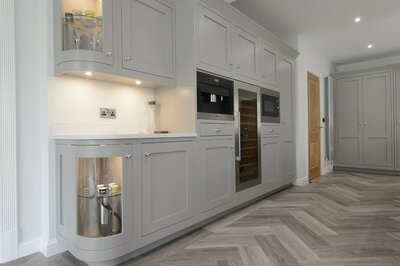 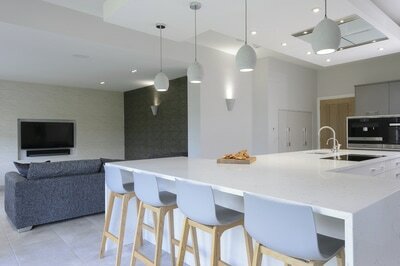 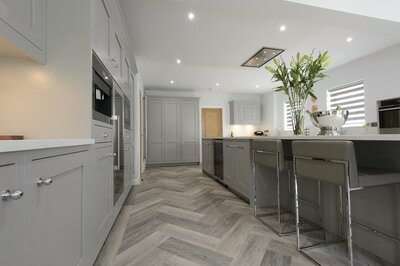 Contemporary Acrylic Kitchen complete with Slab Doors with Miele M Touch appliances, Elica extractor and Quartz worktop. 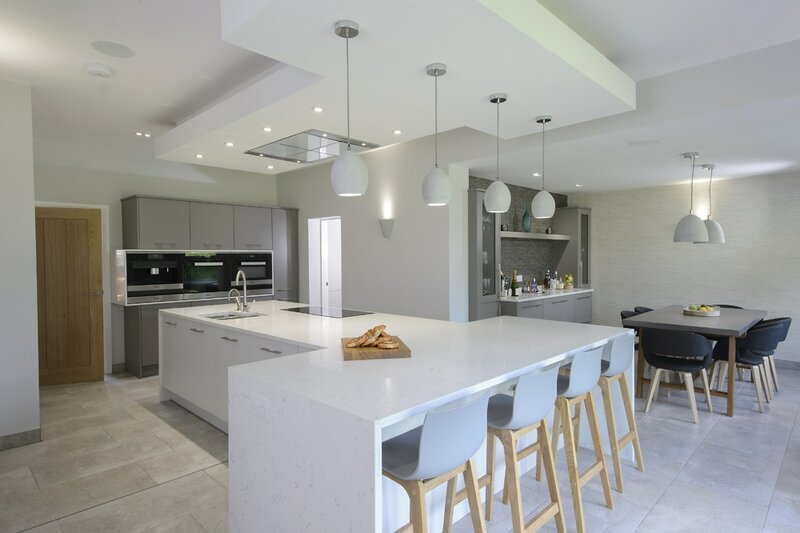 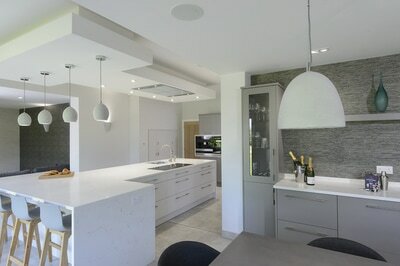 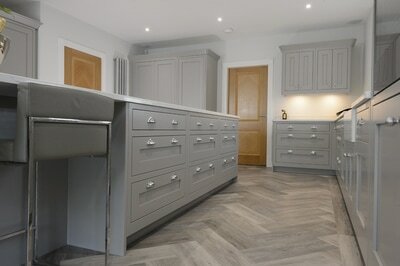 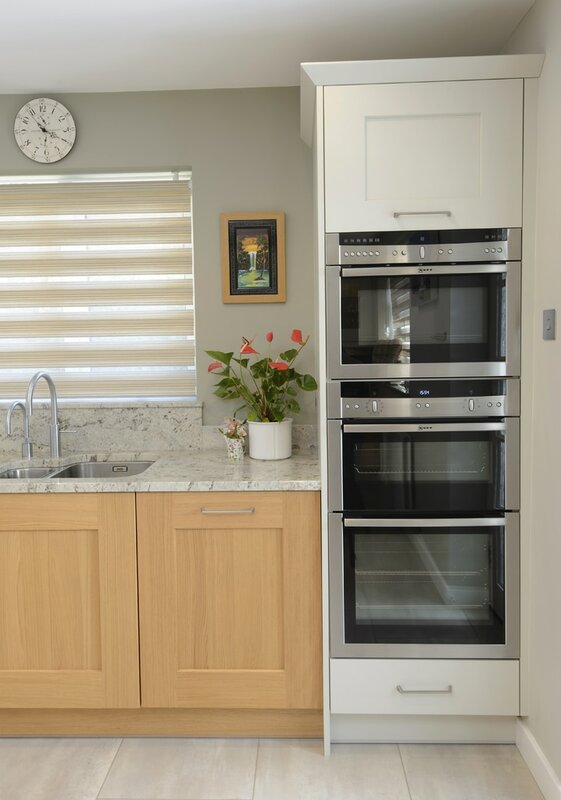 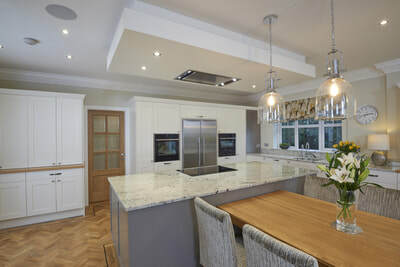 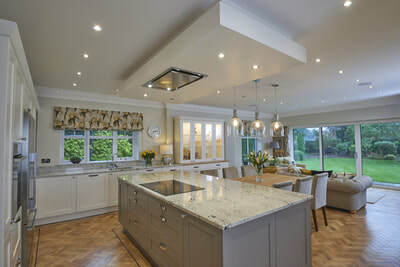 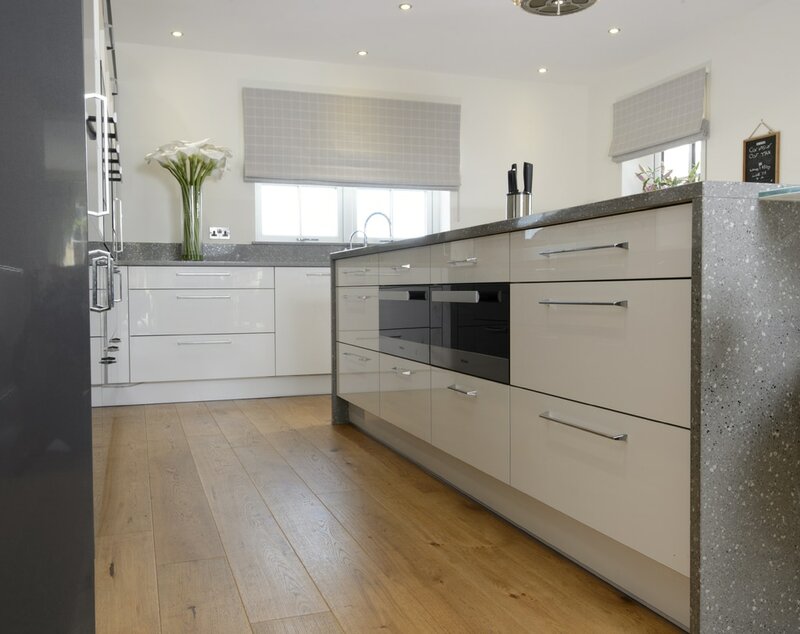 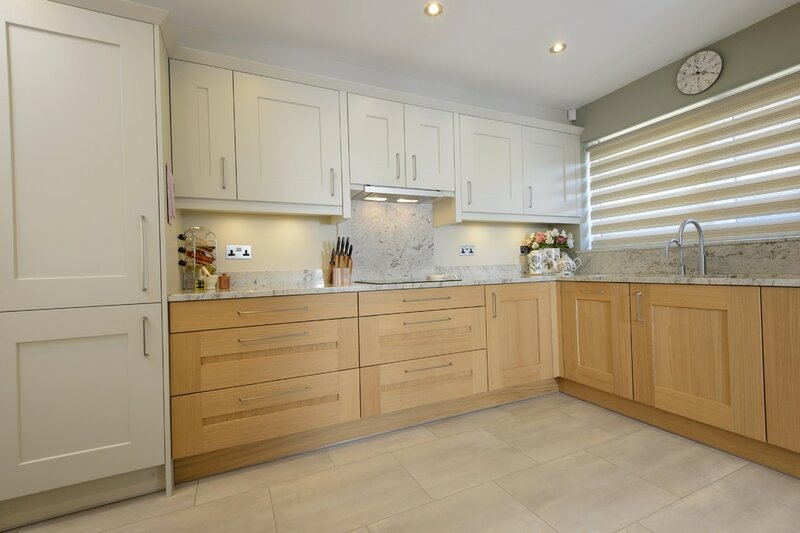 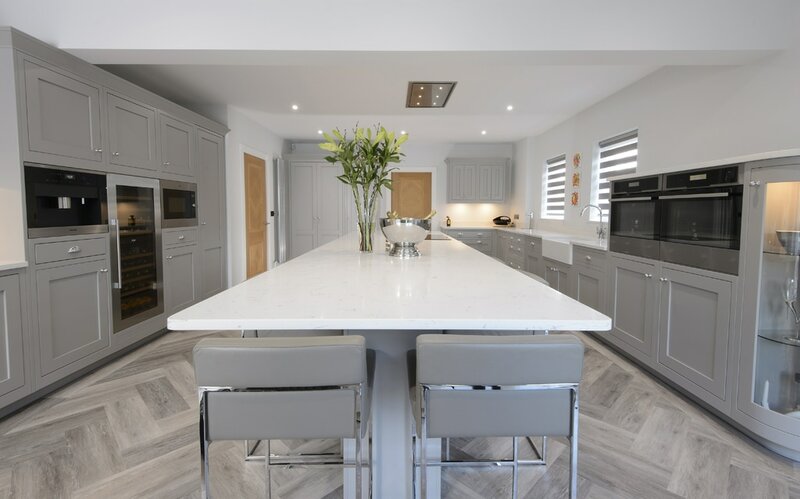 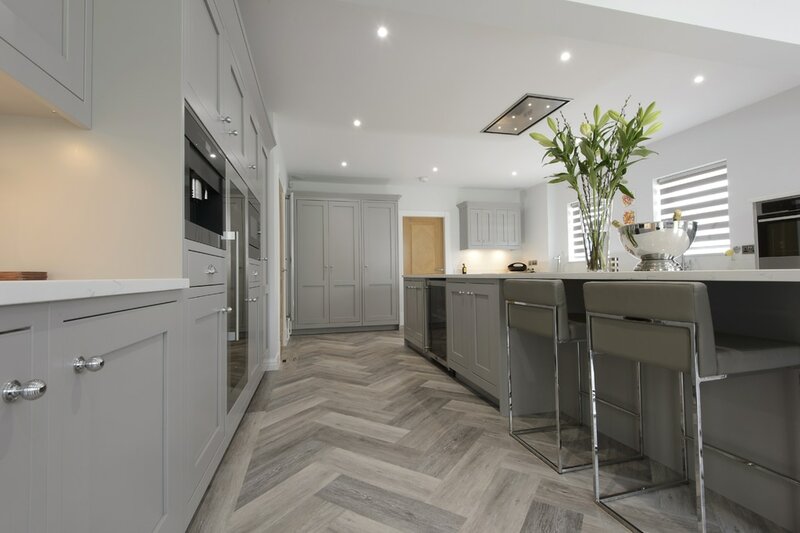 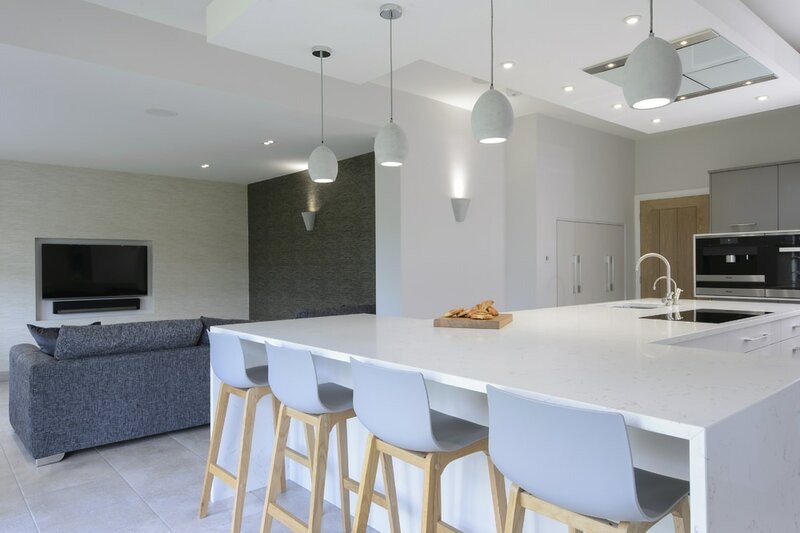 Light Grey Gloss Kitchen complete with Handleless slab doors, river valley white granite worktops, floating glass breakfast bar, smoked glass splashbacks, Quooker boiling tap, Neff appliances and Karndean flooring.